y'all - this is not a dating website. 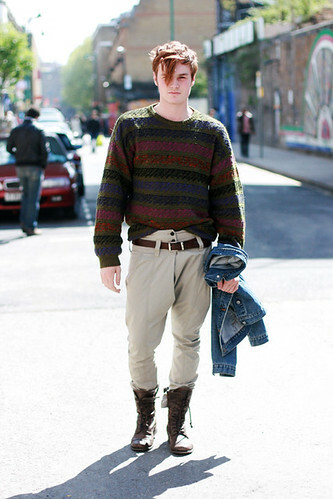 Nice idea but awfully executed - the fit of the jumper is horrid and those trousers make him look like a frumpy woman. I can't even imagine what he would have looked like trying to squeeze his huge jumper into that little denim jacket he's holding. Not cool. not awfully executed at all! lovely contrast between the structured bottoms with boots and the big knit jumper, sort of urban meets country. very cool!